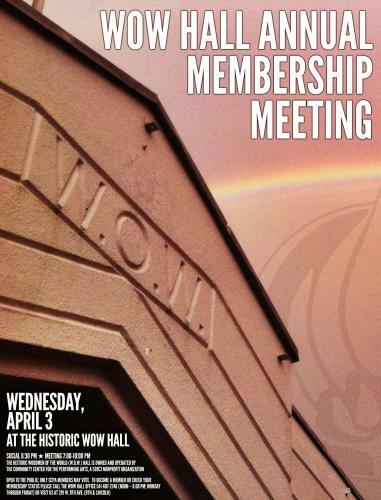 This year’s WOW Hall Annual Membership Meeting is on Wednesday, April 3. Doors will open at 6:30 pm for a reception (featuring food and beverages) and the meeting is scheduled to run 7:00 – 10:00 pm. CCPA members meet annually to approve a policy statement, a budget for the upcoming year and to elect members to the WOW Hall Board of Directors. This year the membership can elect up to five board members, four for two year terms and one for one year. Completing their terms are board members Aaron Dietrich, Hannah Finley and Marlene Monette. Two board members resigned and board members Amy Sherwood and Robyn Kelly were appointed to fill those seats. According to the by-laws, appointed board members serve until the next annual meeting, when they have the option to stand for election. Continuing CCPA Board members are Abe Nielsen-Sword, Henry Weber, Janelle Krinsky and Kathleen Blair. Their terms end in 2020. More members are needed to serve on the Board of Directors. CCPA members who can devote time and skills to the organization are encouraged to run. To qualify to serve on the board of directors, one must have been a CCPA member for at least 30 days prior to the election. This meeting is open to the public but only members may vote. A person can become a member by paying membership dues ($15-30 sliding scale) or by donating ten hours of non-show volunteer time. If you are not a member and want to become one, or wish to check your membership status, please call 541-687-2746 or stop by the WOW Hall office. To join or renew via PayPal, go to www.wowhall.org. Following the meeting, stick around for a reception in the basement.